Following the conclusion of the 5th annual BRICS Summit in Durban, leaders of the member countries – Brazil, Russia, India, China and South Africa – announced their decision to take some significant steps towards financial co-operation. China and Brazil have signed a bilateral currency swap agreement, and all five BRICS nations have agreed on the establishment of a Development Bank and a CRA (Contingent Reserve Arrangement) with the ultimate goal of stabilising and stimulating their national economies. 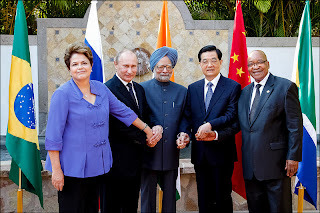 The BRICS countries account for more than one quarter (25%) of the world’s GDP. The main purpose of the BRICS development bank would be to fund infrastructure projects in the countries to the value of £3tn – a vital move as the BRICS bloc find themselves far behind more developed nations in this respect. It’s also hoped that the creation of the CRA will help the countries be better prepared to face financial shocks that may occur in the years ahead. South African finance minister Pravin Gordhan told press that the establishment of the BRICS development bank would present an opportunity “to cover the deficit between huge demands for infrastructure financing… and adequacy of funds that can be invested in infrastructure.” The bank could potentially serve as an effective counterweight to the World Bank and the IMF (International Monetary Fund). The CRA is also expected to lessen the countries’ dependency on these institutions, particularly in times of crisis. The BRICS leaders also appointed South African mining magnate and philanthropist Patrice Motsepe as the chairman of the BRICS Business Council. Motsepe says that the Council is looking to “create opportunities for women-owned businesses, youth-owned businesses, businesses from the rural areas” and of course, small and medium enterprises. It seems exciting and challenging times lie ahead for the emerging economies of the BRICS nations. The location of the development bank’s headquarters is yet to be confirmed. About the author: Nicky Warner is a business blogger with a keen interest in world finance, forex brokers and emerging currencies.